Celtic boss Neil Lennon has condemned those who sent bullets to him and his player Niall McGinn. The packages, addressed to the two men at their club, were posted in NI but intercepted at a sorting office. A bottle was thrown at the Celtic bus on Sunday following the club's victory over Berwick Rangers. Afterwards, Mr Lennon tweeted: "Bottles and bullets today! Wish they'd quit all the stupidity so we could all just concentrate on the football." Police were called to the sorting office after postal staff raised concerns about the two packages. 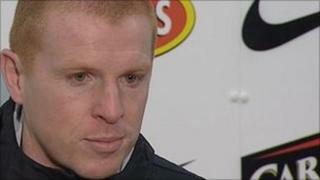 Neil Lennon, a former Celtic captain and Northern Ireland international, has received death threats in the past. He was forced to withdraw from Northern Ireland's game against Cyprus in 2002 after a reported death threat from a paramilitary group. In 2008, he was treated in hospital after being assaulted in Glasgow. Northern Ireland international Niall McGinn transferred from Derry City to Celtic in 2009. Sinn Fein's spokesperson on sport issues, Barry McElduff, condemned those responsible. He added: "Sadly this isn't the first threat made against Neil Lennon and it is extremely disappointing that a young soccer player like Niall McGinn is subjected to this kind of sick-minded threat. "Sectarianism can have no place in sport and all efforts to intimidate those who play various sports must be broadly resisted by all sections of the community as well as those in political and civic leadership."